I saw this exhibit of PBA retro jerseys that will be launched today around 4pm at the Robinson's Galleria. It's about time. The jerseys I want to get are that of Francis Arnaiz (top Toyota #8) and Robert Jaworski (#7). The #22 belongs to Danny Florencio. Cool, ain't they? There were about 20 jerseys. Saw the following: Hec Calma, Jerry Codinera, Philip Cezar, Johnny Abarrientos, Jojo Lastimosa, Manny Paner, Alvin Patrimonio, and Abet Guidaben among others. A must for die hard PBA fans. I also want a Caidic and a Benjie Paras! I am not sure though if there is a Paras though. There’s no method and there’s no madness to La Salle’s talented and mercurial forward. He is in his words, “an ordinary guy who’s driven.” So what drives him? Rebound’s Rick Olivares sifts through the layers. When the drums reverberate inside the Araneta Coliseum, Joshua David Webb initially cannot hear them. He’s got his headphones on and the decibel level gets cranked up. The three-chord riffs of Iggy Pop and the Stooges’ “I Wanna Be Your Dog,” that classic distortion heavy proto-punk anthem for a dispossessed generation, is like a fuel injection that courses through his veins. It pumps him up further and is a moment away from maximum overdrive. “So messed up I want you here. Webb has three tattoos. On top of his right breast is the Latin word “Veritas.” It’s for his Uncle Hubert who has been incarcerated inside New Bilibid Prison since Joshua was five years old. Every Sunday, the entire family goes to visit Muntinglupa unless there’s a game to be played. Visiting never gets old except for the age that begins to show on his uncle’s face. It hurts Joshua. But he never lets anyone in on it. What his uncle has been teaching him is to be strong in the face of adversity. Family is what is important to De La Salle University’s designated human energizer battery. After every match, what follows is an hour or two of dissecting the game – of what went right and what went wrong. His grandfather Freddie, a Philippine Basketball Association legend, is always present to give his grandson some pointers to ponder. So is his father Fritz and his Uncle Jason when he is around. Joshua wouldn’t want it any other way. And his parents, his face lights up when he talks about them. They set him straight and bring him back to earth when he gets overly anxious about things. These are the people who care about him. And they mean only the best. His eyes light up when he sees former Zobel teammates Simon Atkins and Nico Elorde in the seniors’ line-up. The three of them share a bond that became stronger when in 2005; they led their high school team to La Salle’s first secondary title since 1955. Webb and Elorde would later team up once more for a second in 2007 over Ateneo. It was a victory that showed that 2004 wasn’t a fluke and that the Junior Archers were for real. Webb thinks that they have the makings of real pride right in Taft now that there are more homegrown players on board. There’s also the addition of freshman Luigi de la Paz and LSGH standout Ferdinand still manning the slot. “Now we’re gonna be face-to-face. The rush tingles up his spine as Webb runs onto the court with his teammates. He bounces around brimming with energy. He’s got so much charge in him that someone should stick a meter on to him. Webb has a second tattoo; this one below his left wrist. It’s the word “freedom” in Arabic and comes with a double meaning -- one again pertaining to his uncle and the second to himself. If he weren’t playing sports, he’d be a rock star. He says that without hesitation. It’s evident because his eyes light up and that definitely gets his juices flowing. While in high school, he once sang in front of the whole school with an orchestra backing him up. “That was a dream come true.” he smiles. But as soon as he steps on the court, he’s got his game face on. Webb fears no one. As a child, he played a lot of pick up basketball at Bilibid with prisoners. He got so used to it as a kid that never did he once think that it could be dangerous. Uh-uh, he shakes his head. “Maybe that’s why I play with no fear,” he surmises. The inmates have never given him any advice that has stuck with him. That comes from his head coaches. He’s the type of player that everyone loves to hate but would like to be on their side. He knows that so he doesn’t get bothered by the jeers and catcalls from the gallery. “Now I’m ready to close my eyes. And now I’m ready to close my mind. And now I’m ready to feel your hand. I wrote this last year for Rebound magazine so it might read a little dated. But it should give you a better understanding of Joshua who remains a good friend. The issue with the Ateneo Blue Eagles on the cover. Incredibly our first issue to sell out. Thanks, Joshua. I woke up and next to the pain in my legs, yet I thought about yesterday’s final regular season day of 2011 Major League Baseball. Has any day in the regular season been more dramatic? In case you didn't know what happened well I guess you are not a fan of baseball. That's okay. Nobody's perfect. Some might say that Terry Francona is at fault. His players said the blame should go around. Do the Red Sox need a fresh voice inside the locker room? Francona has been at Fenway Park for eight seasons now. I wonder if this is similar to the Joe Torre situation in New York where he was eventually unloaded after the 2007 season after 12 years in the Bronx. And that’s after four World Series championships in six trips to October. Francona could be the fall guy here as Boston has not made the playoffs in the past two seasons. But they should also evaluate GM Theo Epstein’s moves this year. I have been laughing and taking shots at Moneyball in the past few years simply because I think it’s a load of bull. Really have the practitioners of this won anything? Boston competed in the money market just as much as the New York Yankees who team prez Larry Luchino labeled as “the Evil Empire.” Dude, I love the tag. Just keep it coming. Sort of like when other teams cheer “Beat Ateneo!” I am flattered because we have no similar cheer for other teams. Who would have thought that Boston fans would root for the Yankees in their final regular season game with Tampa. If they hate New York they should hate themselves more. 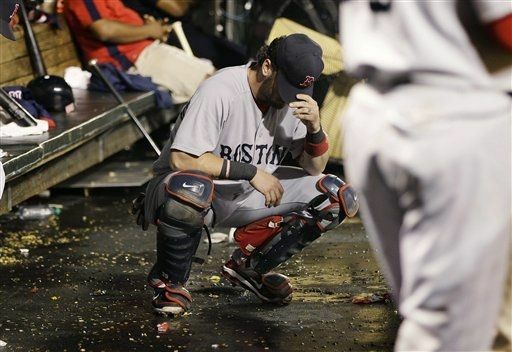 The ALCS collapse of 2004 stings up to today. But winning in 2009 eased the pain. But it’s still there. As for Boston… why are they so down? Monumental collapses are part of their history and appeal? Oh, yeah. They won two World Series titles in the past decade. How about Carl Crawford. He was the stud on those Tampa Bay teams he played with (although Evan Longoria was crowding him for that in the past few years). He transfers to Boston and becomes a Heartbreak Kid for them. That reminded me of former NBA player Steve Mix who played for the Philadelphia 76ers for some time but the team then lost to the LA Lakers in 1982. The following year, he joined the Lakers and the Lake Show played the Sixers that had Moses Malone that year. And the result – the Lakers went down in fo. Do you think that the Yankees played to lose against them and that the D-Rays entry might bite them back in the playoffs? I disagree. This is not like Talk ‘N Text “wanting” to play Petron for the Governors’ Cup Finals of the PBA. If New York didn’t play to win then what was that early 7-0 lead all about? Just because they did not play David Robertson, Rafael Soriano, and Mariano Rivera? In case you have not been paying attention, the post-season begins in a day or two. The Yankees just came off a marathon 14-inning game with Boston in which they lost as well. I’d be more worried about New York going 2-2 in their last four games. They are competitors. They will play anybody. Besides, NY is playing Detroit in the first round. But you have to give props to Tampa Bay. They have been a tough and talented team for the past four years. That win should give them a massive shot of confidence as they play the Texas Rangers. When I saw this match up, I remembered how the two teams met in the playoffs in 2006 where the Tigers came back to win three straight after getting blown out in the opener. By coincidence, 2006 – the year the two teams played in the first round – was the Year of the Tiger. Tiger Woods was the PGA Golfer of the Year (remember the Open Championship that he dedicated to his father who passed away sometime before the tournament. The UST Growling Tigers upset the Ateneo Blue Eagles in three. And the Detroit Tigers made the World Series where they were beat by the St. Louis Cardinals. The lineups are mostly different. Witness. Curtis Granderson was a part of the Tigers team of 2006. He is now on his second year with New York. Joe Torre was manager of New York then and Jim Leyland is still with Detroit. The Yankees’ Core Four is now down to three and after this season, the question is will Jorge Posada still be around? But Joe Girardi penciled him in as DH. I could go on but right now, I’d say that the two teams are pretty much even. It’s going to be an interesting series. New York is going with a three-man rotation with CC Sabathia, Ivan Nova, and Freddie Garcia. I am not sure about that. Not having enough days to rest? They pulled that off in 2009. Not sure if that is doable this time around. Detroit will have Justin Verlander, Doug Fister, Max Scherzer, and Rick Porcello. The Tigers have won four of the seven games they played this season, but how do I see this first round playoff series? New York in four. BOLD, huh? Pitchers wanted and Chuck loves hockey. Saw this on a baseball blog the other day. Guess they took this down from craigslist right away soon after this made the news. And well, now, it's old news. You might want to read this. 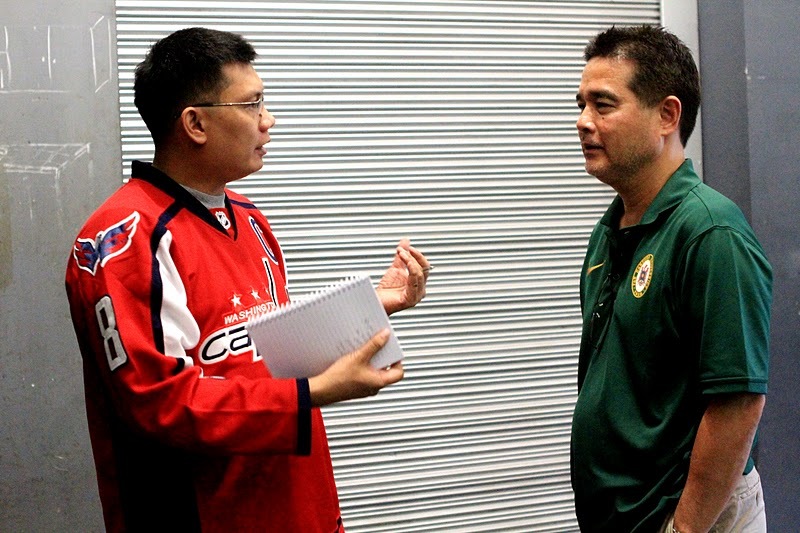 It’s cool that former UST Tiger Chester Taylor is an ice hockey fan. We’ve been exchanging messages about our love for the coolest sport on Earth. I first interviewed Chuck during his final year playing for UST and it was great going to their campus and hanging out with them. I think I did a good job with the story because I’ve become friends with those guys – Japs Cuan who is now coaching the Tigresses, Chuck, Dylan (of course! ), and Jervy Cruz. But who would have thought that ice hockey would be a common passion? 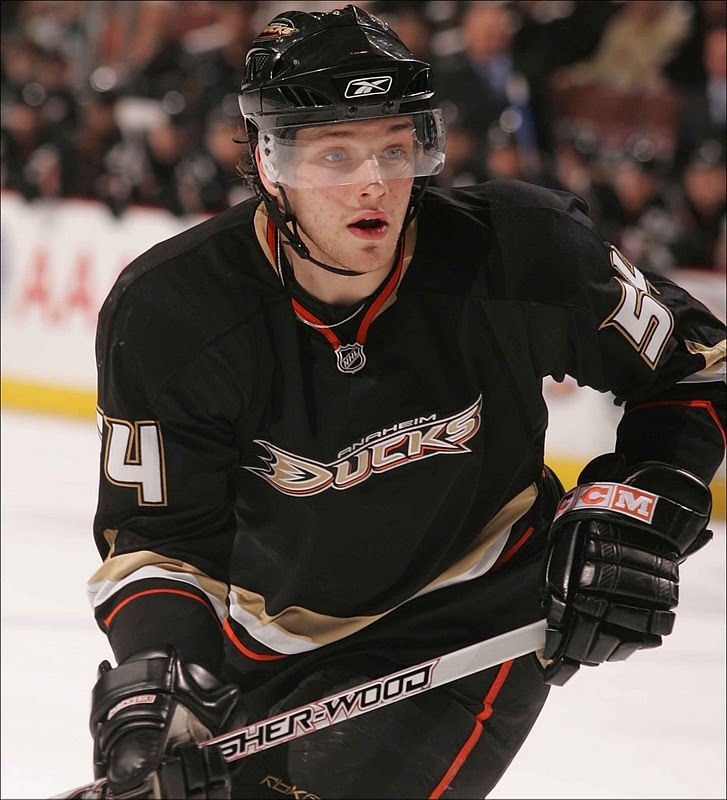 Chuck's favorite hockey player is Bobby Ryan of Team USA and the Anaheim Mighty Ducks. Obviously, the Mighty Ducks are his fave team! He's also a fan of the New Jersey Devils' left wing Ilya Kovalchuk. After two weeks of stalling our shoot of Jaymie Pizarro’s preparation for her New York Marathon race this November, we finally pushed through today. I looked forward to trying to keep pace with someone who is fit and takes part in so many marathons and runs in a year. Wishful thinking. I was there to also film the runs and everything else. I should have learned from my Lapu Lapu Run experience from two years ago – you could do no such thing. Either you run or you film. It’s impossible to do both (I am doing a story on Jaymie's NYC Marathon). The run began at Woodrose and the 5K run around Ayala Alabang was to end at Gold’s Gym just outside the village. I stayed just behind by about 30 meters as she ran side by side with Ton Gatmaitan who is doing next year’s Ironman triathlon. By the time I got to the country club, pain began to shoot up to the toes of my left foot with every stride. Even during my one year in the college track team or even doing casual running I never felt this pain. I slowed down to a walk. I thought that maybe I had not stretched properly or maybe my Mizunos were the culprit (it wasn’t). After a few minutes, I resumed my run. Within second the pain returned and I thought that I was seeing blue spots. Not wanting to give up, I continued. As I turned right into Acacia Drive, the pain became a little unbearable so I decided to walk instead. Within minutes the pain went away. I was now far behind Jaymie and Ton. They took Ton’s car to look for me but I was headed for Gold’s Gym. I told them about the pain. It turns out that Jaymie also suffers from the same symptoms. The foot problem is called Mortons Neuroma. According to the Sports Injury Clinic, Mortons Neuroma occurs when weak arch of a person’s foot that causes the metatarsal bones to pinch the nerve causing it to become inflamed. This is most likely to happen between the 3rd and 4th bones causing a pain or numb sensation on the inside of the two toes that the nerve comes from. How does one deal with this syndrome? Rest. That’s all. Rest. Anyways, I’m not saying I have it. It is just possible that I have it. Will try to consult Doc Canlas this weekend coz we’re running again next Tuesday. Surprisingly, my legs held up. After suffering a basketball injury years ago, I stopped playing. And I began to put on weight because of my inactivity. Recently though, I began to run and walk again and even played seven-a-side football. Time to get back into the thick of things. Jaymie was even inviting me to take part in the next Dream Marathon. It’s tempting. I am just worried about my weight and fitness. But I am serious about getting fit again. This afternoon, my body is a mass of pain. Ran 2.5-3K then walked about another 3K. Not bad. Am quite happy that I did that. Except when we were done, we went over to officemate Oz Arcilla’s house in Sucat where we had chocolate cake. Darn. Now I have to run/walk again tonight to burn that off. Now I hope that my feet are okay. I arrived around 945am at the Palladium at the New World Hotel in Greenbelt, Makati City. There were no media people yet and Clyde Drexler was there just lounging around. I seized the opportunity to do an interview and boy, did we talk about a lot of stuff. This is the transcript of 90% of the interview. Enjoy! Rick: What was it like to play with those guys in Portland and your old college teammate Hakeem Olajuwon in Houston? Was playing in Houston more special since you won a championship there? Clyde: Portland is where I became an NBA player. After college that’s where everything fell for me. I became an All-Star and helped my team to the finals – twice! I had great teammates in Portland in Terry Porter, Buck Williams, Kevin Duckworth, Mychal Thompson, and Danny Ainge to name a few. To go to the Rockets to play with my old teammate in Hakeem Olajuwon was even more phenomenal. And having Charles Barkley as a teammate made it even more memorable even if we were in the twilight of our careers. I spent 11 years in Portland and three and a half in Houston. Everything that happens you have to enjoy. But I can’t compare. They’re different. Let me just say that I got up to play every time I went out there. Not just me but all of us. Rick: I don’t recall hearing or reading anything about you being embroiled in controversy. Am I right about that? Clyde: I do not have one controversy. I am so proud of that! Do you know how hard that is as a marquee player? That’s 30 years and no controversy. I don’t know if it’s been done in the history of the game. Do you know how hard that is? Rick: I know how hard that is. That is why I brought it up? Clyde: That shows you know the game. I haven’t been asked that question anywhere. Thank you very much. I appreciate fans with a good eye. Rick: I noticed that in the 1992 NBA Finals, you did not engage Michael Jordan in any trash talking in the media. Clyde: I didn’t need to. The Bulls had a very good team and I respected them. And talking trash was just not part of my game. I let my game do the talking. In that Finals, my leg was swelling. My right leg -- my strong leg -- every week, they were draining it of fluid. In those six months, there was the NBA Finals and the Olympics and I only had that surgery after that. Rick: You were interviewed by ESPN for their documentary film titled “Once Brothers.” There you talked about your old teammate – the late Drazen Petrovic. Your memories about the man? Clyde: Drazen was an awesome individual who worked extremely hard. And I loved being his teammate. It was a tough situation for him to come in and play right away because we had some very good guards and forwards at that time. I told my coach, ‘Play him with me not behind me.’ But that didn’t happen. Drazen was special but it took him a while to work himself in the lineup. When he was traded to New Jersey – oh my goodness. He was a star there. He just lit it up. He was fun to watch and you ask questions like – what if he was still with us in Portland? I always had fun playing against him. He’s a great guy. I was supposed to visit him in Croatia but you know what happened. This is the part where we talk about Sam Bowie and the 1984 NBA Draft. Rick: Let me ask your opinion about Portland drafting Sam Bowie. I wrote a piece before criticizing those who said that he was a bust. What’s your take on this? Clyde: Why did you write that he was not a bust? Rick: Because Sam was what Portland needed at that time. Not another guard. Clyde: You are right about that. I was there and we also had Jim Paxson, Darnell Valentine, and Kiki Vandeweghe. We also added Steve Colter that year. At center we had Mychal Thompson and Tom Scheffler. We needed help in the middle and Sam had a phenomenal career in Kentucky. Michael (Jordan) also had a phenomenal career at North Carolina but no one knew how Sam or Michael would pan out. Hindsight is 20/20. You might say that Sam was a bust but that was because of all his injuries. If he had been healthy then he would have been a good player. Rick: The way you attacked that basket reminded me of Dr. J. Is that any coincidence? Clyde: The dunks were all about shooting a high percentage as opposed to a jump shot. If I could blow by you for a dunk then that’s a higher percentage. A lot of team’s have seven footers and if you penetrate and get a dunk, and if you do it often enough or at certain moments, you could take the heart away of their team. And we usually end up beating those teams. It was difficult but you don’t see too many people doing that. Sometimes you get lucky and I’ve been blessed with incredible leaping ability. The big guys if they saw it coming they just didn’t want to be there. You could see it in their eyes that they did not want to be posterized. But growing up, I wanted to be like Julius Erving. Be 6’6” like him and dunk like Dr. J. He was a great role model for me that is why I asked him if he could present me when I was elected into the Hall of Fame. I liked lots of players – Jerry West, Walt Frazier – and it’s not just the nickname “Clyde”. Walt was a great player. Anything I did on the court I learned from Doc, Jerry, and Walt. But Dr. J is a tremendous inspiration for me. You say that I am not showy as a dunker and I agree. I dunked to be effective. To help my team win and not do it for style points. I dunked to pump up my teammates and myself as well. And I learned that from Dr. J.
Rick: How cool was it to play for the Dream Team? Clyde: It doesn’t get any better than that. The Dream Team was one of the best teams ever assembled and I was lucky to be a part of that. I had a great year with Portland that year (1992) and we went to the NBA Finals and to the Olympics after that. You see I was injured that year. I wasn’t a 100% because I had a knee problem the whole season. I wasn’t healthy but my leg held up long enough to be a part of all of that. It was a honor to be a part of that. You know that we had something special going on. To see the rest of the world come out to watch us play, practice, or even meet us at the games or the arena, it was amazing. Because I go up against these guys (his teammates) all the time in the regular season and the all-star game, the tendency is to take things for granted. But this was different. It was on the world’s stage. And in the world’s biggest sporting event. It was phenomenal and I have only good memories of that. The All-Star Game is once a year and you only play with some of them in one game. How many games did we play together in the Tournament of the Americas all the way to the Olympics? That was special. Rick: They say that the practices of the Dream Team were some of the best basketball games ever played. Care to elaborate on that? Rick: What are you doing nowadays, Clyde? Clyde: Nowadays, I’m a father. I’m a businessman with some business in the Houston airport. I do color commentary for the Rockets. I play golf, I run, I play tennis. And I do a lot of work for the NBA. I try to watch my son Austin who is a sprinter. He has hops like me but he chose his own path. I’ll support him in what he wants. Rick: What was more difficult – guarding Jordan or dancing on Dancing on the Stars? Clyde: Ohhhh! That’s very difficult. Great question. You guys all know that our cheerleaders are good dancers. Our cheerleaders are very smart and very good at what they do. If you pick someone out of the audience to do what they do it ain’t gonna happen. I’m sorry it just ain’t gonna happen. It takes years to perfect or develop their skills. When I joined Dancing with the Stars it was probably a bad idea. It was fun but I realized right away that it was a bad idea. But you cannot be afraid to do things that you are not good at. You have to try. With me mates James Velasquez and TJ Manotoc. It’s a phenomenal feeling to be the last team standing at the end of the year. For many years you try to get it done. There’s only going to be one winner every year. It’s difficult to find the right team with the right conditions and players to get it done. I worked so hard for that. It was a feeling of relief and well… it was a fantastic feeling. When they put that gold medal around my neck --- that was such a great feeling. We got the job done and we accomplished something great on the world’s biggest stage and now we were being honored for it. It is about giving honor to your country. And to stand there with my teammates all who are legends in the game – it’s a phenomenal, an amazing feeling. I elected to have Julius Erving introduce me. He was my childhood hero. It’s everything I worked for. It was a great moment for me. It said that I did something right in my career. Clyde Drexler has a championship ring from his final playing years with the Houston Rockets. An Olympic Gold Medal during his time with the legendary Dream Team in Barcelona. And a shrine at the Naismith Basketball Hall of Fame in Springfield, Massachusetts. Drexler, the 10-time NBA All-Star, is in town for the NBA Madness Philippines 2011, an interactive basketball event that features basketball clinics, games (including a Clyde Drexler Challenge where fans get to compete against the NBA Legend for prizes), and a live viewing party. The Portland team that followed the breakup of Drexler’s squad that competed for two NBA titles in 1990 and 1992 was derisively known as “the Jailblazers” for their run-ins with the law and the tight-knit Oregon community where the Blazers played. Drexler was interviewed for the ESPN 30 for 30 documentary film “Once Brothers” that told the tragic story of the breakdown of Petrovic’s relationship with Vlade Divac during the Yugoslavian civil war where Croatia ceded from the Balkan republic. Petrovic, along with teammates Toni Kukoc and Dino Radja to name a few were from Croatia while Divac and Zarko Paspalj were Serbians. It took me almost two hours to get from where I live to the Palladium at the New World Hotel where the press conference for Clyde Drexler was held. When I arrived, there was no one yet there save for a few of the NBA and Gatorade people. 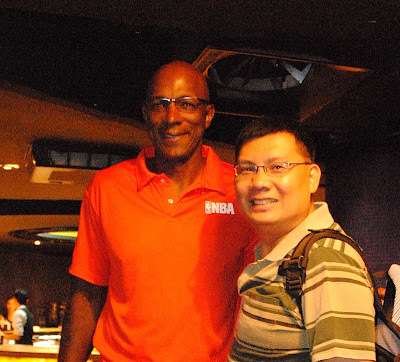 The NBA Asia's Carlo Singson introduced me to Clyde who was just lounging around and I got on with an early interview. We chatted for close to 30 minutes total. Watch out for the rest of the interview. 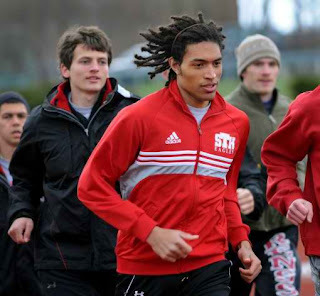 Austin Drexler is a sprinter on RPI track team. When I woke up this morning, I said to myself I didn’t want to get up. I could have used a few more hours of sleep that always seems to be in such short supply. Then I began to receive a lot of text messages inquiring about the UAAP games today. A quick check with the league authorities indicated their continuation. Personally, I was against it considering the horrible weather. When I spoke to the four teams that played today (women’s and juniors) as well as FEU’s Anton Montinola today, they were all glad to play. They wanted to. They were all psyched up to play and they were nervous that all that energy would go for naught had it been postponed. But the weather – it brought back a lot of unpleasant memories. I was a victim of Typhoon Ondoy two years ago (like many others) where my apartment was underwater and I lost much of what I own (also to looting). In many ways, I was happy to watch the UAAP basketball games (Women's and Juniors) that pushed through today. Mr. Montinola told me after the Juniors game that he advised Ateneo to wait ‘til 12 noon before making the decision to postpone the seniors match because the weather would have cleared somewhat. And it did. But then again not everyone lives in the Cubao area so it was again for the best that it was postponed. I saw some comments about how the finals series will turn against Ateneo (they cited 2006 when the Blue Eagles lost to UST). Now don’t get me started on that finals. That typhoon theory has been blown to smithereens with the 2009 finals between Ateneo and UE. “Jerie Pingoy is Jerie Pingoy,” exclaimed National University head coach Jeff Napa. The Cebuano point guard scored 17 points in the first half and looked spectacular as he routinely beat his guard with his quick first step and devastating pull-ups and floaters. That was 17 points in 15 minutes in the first half. Talk about devastating. He gets where he wants to go. Can anyone guard him? But what got the FEU Baby Tamaraws their 29-19 halftime lead was the strong play of Al-Jonier and Janner Hassan. I loved following the FEU Juniors squad this year. Not simply because of Pingoy, this year’s MVP. But I love the energy the Hassan brothers bring to the game. They are an unrefined product with great energy. If you watch Al-Jonier, you have to like his willingness to sacrifice his body inside the lane as he takes charges and tries to block drives all while taking an elbow to the face. No Baby Tam gets hammered more than this kid. I wish he’d stick that mid-range jumper with better consistency. Their shooting coach should tweak the mechanics of his release. A little more and he’d help his team a lot. The brothers played great D, got the rebounds, and scored to points to put them up going into the break. However, come the second half, I thought that the NU Bullpups found a spark of life with the strong play of Raph Atangan and Paolo Rivero. 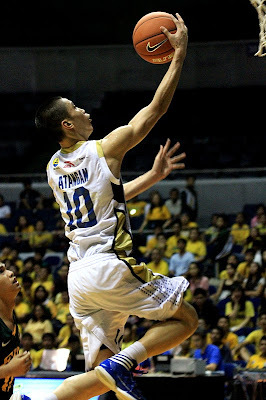 When I saw Atangan play last season, I was reminded of the Letran Squires Jarelan Tampus (of course he is now with La Salle) with the way he drove hard to the basket and scored on all these twisting layups. He should be awarded three points per bucket for the degree of difficulty. NU played great D in the second half while Pingoy went mental – in the wrong sort of way. In FEU’s first six or seven possessions, Pingoy took the shot or turned it over. That just killed them right there. The ball never was whipped around and the others were not able to get into the game anymore. Pingoy scored only four points in the second half – a bucket in third and another in the fourth period. The halftime adjustments of NU were simple – crank up the D and let Pingoy shoot himself out of the game and stop his teammates. I had to ask Napa about his wards’ atrocious three point shooting when he himself was such an assassin for the Bulldogs during his playing days. “Mahuhulog din yun,” he said optimistically. Wherever the Bulldogs end up in this series, this is their best showing ever and Napa has done a good job. As for FEU, it’s been 25 years since they last won. That was when Johnny Abarrientos was manning their point. So history will be made right here in Game 3. Someone asked if I bought Steven Gerrard’s autobiography. I am not too big on sports bio books but this one I picked up. And I enjoyed it. I wasn’t written I am sure. More like dictated then someone transcribed it and switched stuff here and there to sort out the ramblings. Still not bad. Gerrard’s story fills in a lot of gaps in my knowledge of Liverpool history. Books. I have a huge backlog of reading material. About 25 books now? And that’s not counting the magazines. Heavy rotation on my iTunes: Eyes Set to Kill (White Lotus), Arch Enemy (Khaos Legions), Dream Theater (A Dramatic Turn of Events), Taken By Cars (Dualist), Go Jimmy Go (Roots Rumble), Weezer (the blue album), Sigur Ros (Með suð í eyrum við spilum endalaust), Highball Holiday (self-titled), Death Cab for Cutie (Codes and Keys), and Yes (Fly from Here). How’s that for eclectic? Will comment on Smart Gilas in a day or two. Let me clear my head and ask some questions before I sink my teeth into that. Am surprised that the UAAP basketball championships will push through today in spite of this horrible weather. What on Earth! I know. I know. I cracked on my Facebook and Twitter account: “UAAP Season 74: All out. All heart. All weather.” So if you see someone use that line you know where they pilfered that from. I am all for seeing the games push through but not like this. It is putting people in harm’s way. Am in the midst of watching Season 5 of Top Chef. I got the original DVD. Of course, it’s New York. And love the challenges so far – to prep food based on different places in the city, to cook for the Foo Fighters, to cook on the Today Show… Okay. Stop. I’m only at that episode so far. I am wishing for a few days where I didn’t have to work and instead stay in the kitchen and cook stuff. Quite an interesting shift in interests. Too late to be Top Chef but I can still do stuff in the kitchen. I shift from one thing – doing office work at home, listening to Dream Theater’s new album A Dramatic Turn of Events, and falling asleep. Yes, I did. My king-sized bed has my pillows, laptops, and portable DVD player. If you looked at my bed from above it would resemble a work station. Now how I do not roll over my stuff is an art. Hahaha. I got used to sleeping on a couch, one airplane seat that I don’t need to roll over the place. I woke up around midnight. Put in a few things then dozed off around 130am. I need to have a normal life.